In my short time here at TmoNews one thing’s become increasingly clear: Many of you are frustrated by the coverage in some areas. Some of those are only a short distance from major metro areas, who get the benefit of the carrier’s fastest available coverage. Incredibly frustrating for you guys, I’m sure. Others – more understandably – are in rural areas of low focus for any carrier. As I’m typing this, T-Mobile’s chiefs are wrapping up the Q&A session in its Q3 earnings call, the results of which I’ve already posted, but I wanted to highlight in a little more detail some of the most important points and explain that – as a fan of T-Mobile – I’m more optimistic than ever. Firstly, John Legere made it absolutely clear that the past quarter has been “outstanding”. The company added over a million net subscribers. Over 670k of those were postpaid adds, which – any way you look at it – is impressive. For reference, that’s the highest net adds of any of the US’ major carriers, and is – in fact – more than all other carriers put together. Tmo was also clear not to attribute this success to the addition of iPhone. They’re delighted to have a good range of devices, now including all the top Android and iOS devices, but it’s the UNcarrier strategy that seems to be pulling in the new customers. Since the JUMP! offers kicked off in July, T-Mobile has signed up 2.2 million subscribers to those plans alone. That’s pretty astonishing. But then again, it’s not surprising. 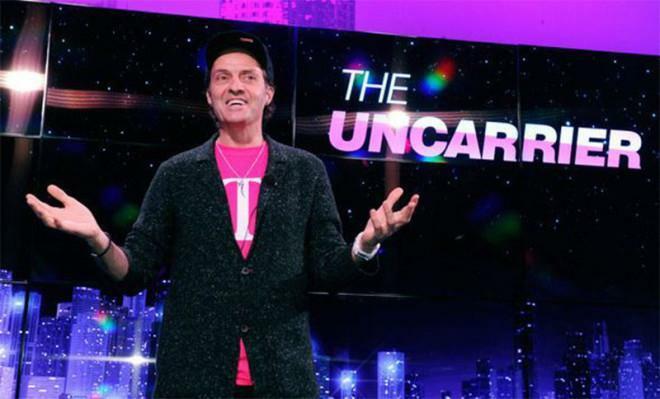 Between March (when the UNcarrier movement started) and now, the carrier has tackled three of the biggest complaint points of the carrier-controlled US market. Firstly, device and contract plan costs were separated, then customers were offered the chance to upgrade early with JUMP! then international roaming charges were killed off. With this popularity and growth, the company has obviously pulled in a healthy amount of revenue which it fully intends on investing in service/coverage. One of those is investing in expanding MetroPCS market coverage. On November 21st, it’s planning to bring MetroPCS’ service to 15 new markets. 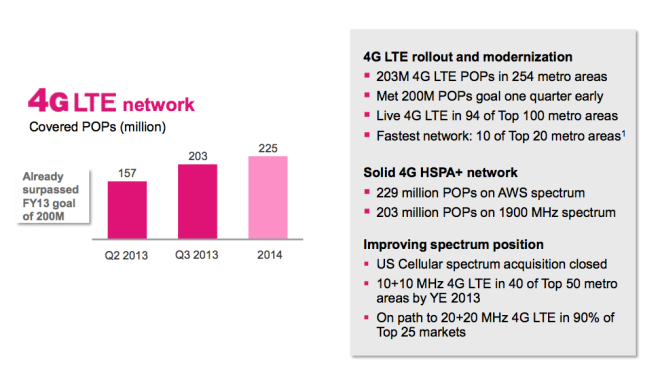 But, perhaps more importantly, T-Mobile’s own 4G LTE is expanding and will continue to expand. But not just expanding, it’s getting faster. By the end of this year, 10+10 LTE will be in 40 of the top 50 metro areas. For reference, Tmo stated that speeds on this network were around 72Mbps downloads and 20Mbps up. May sound great, but, that’s not where it ends. Next year its 20+20 rollout will be kicking in to high gear and will be in 90% of the top 25 markets offering around 147Mbps down and 40Mbps uploads. HSPA+ in both AWS and 1900MHz spectrums are strong with each approaching national level coverage. And, with U.S. Cellular spectrum purchased in the Mississippi area, it’s growing well. One thing that struck me about today’s call was Legere’s insistence that the company isn’t done yet. The latest phase of UNcarrier movement isn’t necessarily the last, and coverage is still going to grow further. They announced that they’re “still exploring opportunities to acquire spectrum“, so we don’t think the U.S. Cellular spectrum acquisition and Metro PCS moves are the end of T-Mobile’s plans to challenge the top carriers. From my point of view, I don’t think the future’s ever looked brighter for the magenta colored carrier. Legere stated “We’re not done yet” and “UNcarrier is working!“. The company wants to offer coverage matching that of AT&T and Verizon as well as keeping hold of the “UNcarrier value”, but doing it in a sensible but deliberate manner. It’s a winning combination. In short: Watch this space. I Know it’s the wrong article lol, but a BIG WELCOME to our Family, my European brother. Does rolling out 20×20 mean improved coverage or just faster speeds? Faster speeds through less congestion. Think garden hose vs water main. No it doesn’t. Why would more bandwidth mean more coverage? You’re claiming that 10×10 only brings faster speeds? If so, you’re wrong. Why would increasing from 5×5 to 10×10 improve coverage? You get a stronger signal therefore at the weak parts you can go just a bit further. Yes, a LITTLE bit further. You won’t get ATT- and Verizon-level 700 MHz coverage from increasing to wider bandwidth. This comment just goes to show a lack of understanding about the U.S. Market. First of all, to say that rural areas are a low focus for any carrier, means you obviously have never looked at a Verizon map to understand that their LTE network already covers many, many rural areas. And many of the areas where T-Mobile has 2G coverage, there are multiple carriers providing 3G coverage or better. Sprint has already announced they’re upgrading ALL sites to LTE regardless of population and some rural areas already have LTE. Low focus doesn’t = Not there at all. It means, they focus on metro areas as a priority, and get networks up and running there before tackling the areas with fewer people. No major carrier’s rollout has started with a rural rollout. Of course Verizon covers many rural areas, but they didn’t start there, and they’ve had longer to roll-out LTE than T-Mobile. Yeah. I agree. But, I needed to make some sort of distinction between the way carriers roll-out metro vs. rural coverage. One clearly comes before the other. And Verizon does deserve credit. They’ve expanded 4G incredibly well. No, Verizon deserves nothing. If anyone deserves credit for deploying LTE to rural areas its Sprint. Unlike Verizon who had EVDO in rural areas, Sprint neglected many rural sites with only 1x data and 10 years later are making up for it by moving directly to LTE. In fact, they love rural areas so much, they neglect their major urban markets now and let TMobile steal 85% of their unhappy fleeing customers. Cause they had low-band spectrum. Tmobile didn’t even BID in 2008 auction. In all honesty, rural areas are less of a focus for a smaller carrier than higher populated metropolitan areas mainly because of the average revenue per user (ARPU). Verizon happens to have had a significant head start on LTE rollout but they started with the major metro areas first and then expanded to smaller cities and towns and rural areas. It’s the nature of the beast. T-Mobile has a long way to go to get the same type of coverage but the progress they’re making where they have their customer base and potential customer base is tremendous. If they can get the rest of the available 1900mhz refarmed for HSPA+ and get additional spectrum in the AWS bands or in a coming auction (600mhz) they have a chance of getting some significant coverage improvements. What does refarming PCS for HSPA+ have to do with coverage? Coverage doesn’t become better as you add more 5×5 channels. I should have been more specific in that there are people in this thread and others who talk about coverage in relation to whether they’re on EDGE, 3G, 4G, HSPA, LTE or pony express as it feels at times. There is no question that as far as physical footprint T-Mobile is by far and away smaller than the rest. And towers are going to be the primary way of expanding that footprint, assuming the specturm is there. But there are areas where the network is operating on EDGE and hasn’t been refarmed which is a cause of frustration for many, myself included. Improvement there will go a long way for people. That all said, T-Mobile is moving in a positive direction. If they keep doing what they have been doing it should be interesting to see what happens next. But I certainly won’t pay more to subsidize those living in dust bowl states to have LTE before I do..aka like I’m doing on Sprint. So I use TMobile as a primary prepaid line because their focus is San Francisco, unlike Sprint who’s focus is on offering places like Boise City Cimmaron County Oklahoma aka Dust Bowl Ground Zero, LTE service before I get working service. A lot of the rural coverage Verizon has came from them buying the smaller companies that had already established coverage in those areas. He’s talking about LTE BUT you’re not totally off-topic. No carrier just starts building out LTE where they have absolutely no customer base; they need to have a return on the investment. TMO needs low-band spectrum. That auction won’t come until 2015 and it won’t be deployed until late 2016. Its good that Sprint is pushing all its sites to LTE. I think with Verizon & Sprint pushing LTE to all their sites, T-mobile will be forced to follow. Seeing as how T-mobile wants to keep its momentum, I’m hoping that they will start that push sooner than later. If T-mobile wants to get to the level of customers that AT&T & Verizon has, they are going to need to expand their coverage map to something that is competitive with them. First, they need to at least get their coverage map to at least match Sprint. C’mon T-mobile! Make it happen! Sure! They’ll make it happen. Will you agree to increase your cell bill by $20 for no additional data? No? Then stop complaining that TMO is being cheap when they have the lowest ARPU of all 4 carriers. God, that was the first thing I thought. AT&T and Verizon have 700 MHz for LTE and 850 MHz for voice, 3G data. TMO has no low-band spectrum. TMO would have to use 3 sites for every 1 site AT&T and Verizon use. You can’t compare the two. If you want prime coverage, you don’t use the sub-prime carrier. Their 2G coverage is already on 1900. So upgrading their existing 2G coverage to 4G does not require more sites. AWS has approximately the same reach has 1900. What does that have to do with Verizon? Verizon is using 700 MHz, not AWS as their “broad coverage” band. PLEASE PLEASE Tell me that T-Mobile is hot after the 600Mhz spectrum up for sale early next year. This will.help two things. 1. The signal will travel further. 2 Better building penetration. Both of these help for better coverage. Actually the signal travels less. But has more power to penetrate buildings. Higher frequency means better for open areas because it has more reach but less building penetration. Because AM radio relies on ground-wave propagation, meaning its signals can follow the curvature of the Earth. FM radio (including the now-defunct analog TV) is strictly line-of-sight. Lower frequency travels farther distance and penetrates better. How will T-Mobile compensate for this? It’s not for sale next year. Maybe 2015. The big thing will be getting more spectrum.. I was hoping to hear more on their Shared Spectrum trials with the US Govt. That will impact a large area where they have EDGE or GRPS service only. Many gripe about lack of 3/4G service.. not realizing that T-Mobile can’t just pop in a tower.. Not only do they need licensing/spectrum, but the HELL towns / cities put Carriers through to allow new towers is laughable..
Google Cell Tower Tree’s.. Towns make them dress them up as tree’s, small buildings, etc.. and thats after months if not years of negotiations. ROFL! If you don’t have service, check with your local city, see if T-mobile has been trying.. you’d be surprised how often they get blocked for one political reason or another.. Anyway, glad to see they are continuing to move forward. I think that the issue is spectrum. As far as I know, T-Mobile has more towers than Verizon Wireless does, so the number of towers isn’t the issue. Using the higher frequency spectrum means that the existing towers don’t provide service to as many people as another carrier’s tower that uses a lower frequency. Correct me if I’m wrong on this. Im not certain on the number of tower owned and who owns more. However I do know you absolutely correct about the need for the right frequency spectrum. Lower the frequency the better coverage we will have. There is a bid for old TV spectrum the 600Mhz to be exact. ATT has 700Mhz and Verizon has 800Mhz spectrum for their LTE signal. From what I understand the FCC is gonna try and give Sprint and T-Mobile a real shot at this. FCC wants competition. If it just comes down to the highest pocketbook then T-Mobile and Sprint doesnt have as much capital as AT&T or Verizon. This auction doesnt have a set date BUT is schedule for sometime 1Q2014. with the death star,and big red. If am I wrong correct me. Not a Sprint fan. Let’s not forget Sprint has brought out $65.00 amonth plan,don’t know all the details,just see the ads for it. Yes, you are correct. Softbank from Japan owns roughly 70% of Sprint. You also read my mind in that Sprint/Softbank have alot of capital to spend. Dish network was in a bidding war with Softbank for Sprint. Softbank won. It appears they have alot of cash to spend. We shall see how this all plays out next year. I hope Tmonews follows this closely as the time grows near. Softbank is not giving any more money to Sprint. If Sprint needs more, it will have to borrow it. After the initial $5billion infusion, no more. They do not need anymore money. After the infusion, they also raised 6.5 billion in capital and according to some reports, they have over 10 billion cash in hand. Sprint is fine monetarily( they still have a ton of debt, but that is not going to rear its ugly head until much later). Sprint is still gonna struggle for a quarter or two, but if they come out in 2014 with their Spark network, they could really throw a wrench in everyone’s plans. That spark network cannot be matched by any carrier. Softbank is not giving Sprint any more money beyond the initial $5 billion infusion Sprint got. Tmobile doesn’t own any of its towers; it leases space on towers owned by companies like Crown Castle. Tmobile is on 54,000 towers pre-Metro PCS merger and covers 280million with PCS GSM. Saw an interview with the Dish CEO on Bloomberg yesterday. He said they’ve got spectrum and are still thinking of getting into the mobile business. If they can’t do it on their own, he mentioned partnering with ATT or Tmobile is a strong possibility. Don’t know what would happen to Tmobile if that would happen. Probably would be bundles with Dish but would regular rates go up. If I could upvote this a million times I would. In Northeast Denver a company wanted to put in a new tower and the neighborhood association pressured the City Council to vote it down. Shared spectrum trials had to do with 1700 MHz, not low-band. No help there in coverage. It’s LOW-BAND that TMO needs. I’d rather have LTE and get off of EDGE. When is this going to happen? Pathetic, even the prepaid carriers in my town offer 4G. You’d rather have LTE and move off EDGE..when will that happen? When you leave and go to a prepaid provider that offers “4G” in your area like you claim. Which ones? Are you talking about Straight Talk wireless which uses ATT’s network? I am getting excellent speed test results without LTE on my new Blu life play4G. How do you like the Blu Life? It’s a excellent device. Holding it in your hand you wouldn’t think it’s a 229$ device. It’s very well built and the screen is just as good as any Samsung amoled not better and the Battery life is awesome. Im in Atlanta and go a couple minutes away in a pretty large city of Decatur, and I can’t even make a call in some areas. Last year was in Jacksonville (again a major populated area) and drove on a major street near the ramp on a major expressway and again couldn’t even get a signal to make a call. had an emergency and had to walk to a gas station and beg them to use their landline. I also couldn’t get a signal at my brothers house where everyone else with ATT could. These aren’t rural areas. They try to attract business customers, but those people often travel a lot and need to have coverage. A friend of mind drives a lot for work and can’t even try Tmobile because of it. Sad because ATT and Verizon rates have gotten so incredibly high. As a single person, Im really pissed at ATT for getting rid of individual plans. Paying $100 a month for a couple gb or less is ridiculous. Thank God, Straight Talk now offers LTE on ATT. It would be nice if they’d do that with Tmobile too but I guess Magenta has to keep something for themselves. But when I can get 2.5gb of LTE for $45 using an ATT Sim card, I don’t see why I would pay $95 for only 2gb on ATT. The Nexus makes prepaid super affordable for people who want to save a lot of money. Straight Talk should really advertise it (and Tmobile shouldn’t mark up that phone by $100 or more). If you’re in Atlanta, shouldn’t you be on Sprint? Sprint has upgraded 92% of their sites with LTE. And when they activate their band 26 800 MHz, you’ll have coverage equal to VZW. I live in California, my town has 200,000 plus people in it. In my house I get excellent T-Mobile service. If I’m at my school which is on the outskirts of town I have one bar of coverage. I think T-Mobile is doing a great job of improving the network and making it fast but they should make coverage a priority next. Build out, infill and coverage upgrade (2G to LTE) are coming. It was spoken to by a person from engineering at a regional meeting. No time line was given specifically, but will start after the major LTE currently under way is done. 225 Million Pops covered is a mirage and an unverified claim. T-mobile has not posted a single coverage map for their 3G (PCS) nor for their LTE bands. They get away because of a toothless and corrupt FCC and FTC, and can claim wild coverage figures. The ground reality is that LTE in many cities is only in the downtown areas. In the suburbs anyone’s guess. If this was UK or Europe the regulators would not allow such blatant claims without even providing a single coverage map. I think you need to re-check the coverage map on the main site, Nearmsp. I just visited there and struggled to see anything other than information about LTE coverage. I typed in several addresses around the country and it tells you the service level available for the location. Since their LTE and 3G (PCS) footprints will be almost identical at this stage, I think your point has been addressed, though not quite in the way you were hoping. Try looking at Maine. The best they have anywhere here (except for 1 or 2 towers just over the border in Portsmouth, NH) is HSPA+ 21. I wasn’t suggesting that you can find LTE everywhere, I was simply answering Nearmsp’s suggestion that TM still do not publish LTE or 3G (PCS) maps. Convince AT&T to give up their cellular 850 MHz block and TMO will have coverage everywhere. People here are so ignorant of spectrum issues. Go to s4gru.com and educate yourselves. I just went to their site and their map doesn’t show LTE coverage at all. All you can do is put in a zip or address and tells you if you have LTE at that specific location. The coverage map only shows strength of signal, not technology used. They are the only carrier not to provide that information, because they don’t want you to know how small the actual footprint is. If I go a few miles further out of town, it says: “Your 4G high-speed coverage is: Very Good.” Get the distinction which defines the technology? I have no idea what you are looking at if it doesn’t show that. All you just stated was a repeat of my post. It only shows a note for your specific location. The map doesn’t show coverage in the area for 4G or 3G. Scroll down the page and look at the legend where it states the colors ONLY indicate strength of signal, 2G, or roaming. With all due respect, it wasn’t. It depends whether you define the map as simply the basic image, or you consider it also embraces the ability to drill down into the detail. Living in the 21st century, I consider it the latter. I’m saying the information about technology is provided, just not in the manner you expect. It’s called coverage obfuscation. It’s a marketing tactic to trick people ignorant of cellular coverage. Yes, they are hiding their spotty LTE coverage. Deal with it or go to VZW or ATT, k? I was correcting the person I replied to, about the map showing coverage for 3G or 4G. I’ve dealt with T-mobile’s spotty overall coverage for 11 years. Just because I save more money doesn’t mean I expect great coverage……K? Tap or click “T-Mobile” in the map area. Take this with a grain of salt, as I haven’t been able to find the source of the map info. But I have compared it with a full version of T-Mobile’s most recent 4GHSPA and 3G coverage mapps using the cellmaps app, and the T-Mobile LTE map shown on Verizon’s site is definitely different from the 3G/4G map in the cellmaps app, which uses official carrier data. Just listened to TMO’s internal earnings call. CTO and CEO promised to upgrade the 2G towers and expand LTE up to 260-280 POPs with plans to integrate low band spectrum for 2014 going into 2015! Now that’s a real nationwide 4G!!! Acquiring Sprint is also the goal too! Sadly, we will need new phones for the 600 MHz bands. Auction won’t occur until 2015, network won’t be deployed until late 2016. If T-Mobile is going to truly expand coverage, I hope they are upgrading the backhaul at these cell sites now with fiber or improved microwave, so LTE deployment can happen rapidly. They are upgrading 37,000 sites with LTE, at least in the first wave. That’s only going to cover 232 million that have TMO 3G or faster with LTE. Notice that he says the 37,000 is ONLY for the 3g/4g footprint. Almost every cell site in America on any carrier is using fibre. Even if it’s only 2G. It might not have the best backhaul, but fibre has very clear advantages for a voice network. And it makes the towers that much more upgradable. Almost every cell site in America? I thought that Sprint was upgrading their towers’ T-1 lines at their towers to fibre lines. Are we sure that T-Mobile is upgrading their towers with fibre or have them upgraded? Remember when T-Mobile announced that their 4G network has HD Voice, they never mentioned the entire network or their 2G network had HD voice. Fibre lines not being present at these cell sites could be the reason. 600 MHz auction won’t even occur until possibly 2015 so . . . where did you get your info? Notice the slide above? It says 225 million on LTE for 2014. FYI, tmo currently covers 232 million with 3G or faster. I just listened to the call twice and did not hear that. Ditto. I am moving to TMO from VZW but that’s only cause in metro Detroit, TMO has good coverage. They were talking about this between 20 – 30 mins mark. Auction won’t occur until 2015. They’re not gonna expand to 260M pops in 2014. I heard them talk about getting lower spectrum but not the 260M POPS stuff. I will listen again. You actually referred to it as 10+10! This made me very happy. John Legere gave several shout out to Dave! “Others – more understandably – are in rural areas of low focus for any carrier.” Cam that is a very naive statement to make. Verizon, AT&T, and even Sprint have more build-outs in rural areas with broader coverage and faster data speeds. We have to stop making excuses for T-Mobile and push them to upgrade the old 2G network. The upgrade would be beneficial to us, the consumer, and the carrier. You have to spend money to make money. More people are willing to leave Verizon and AT&T, but only if they know they are sufficiently covered. Everyone expects dead zones here and there, but not when large areas are not covered or covered in 2G. AT&T knows this, which is why they are moving to get rid of 2G by 2017. What is T-Mobile going to do? This is one question they refuse to answer. Their ability to improve coverage will be determined to some degree by their opportunities to acquire additional spectrum. Since there isn’t a store to which they can just go to buy new resources, they have to depend on FCC auctions and on other carriers who are willing to sell their spectrum holdings. It’s therefore hard to answer questions about such a situation in a concrete way. While you may have to spend money to make money, Deutsche Telekom – who are still the major shareholder in TM – have been chasing the $50+ billion they spent in acquiring the companies that became TM for over 10 years now. Had they successfully completed the $39 billion sale to AT&T, they would barely have come out of the experience with a profit over their whole investment. That means they are going to continue to rely on smart strategies rather than wholesale investment to move forward. In the end, their revenue base remains the smallest of the main carriers, and their pricing remains the most aggressive, resulting in a lower cash flow from which to fund network expansion. With one form or another of TM’s 4G service now reaching over 70% of the population, it is doubtful that we will see an aggressive program to expand service in rural areas, but they will continue to extend the range of their 4G service around the fringes of the MSAs, as we have been seeing sporadic reports of them doing over the last year or so. Their original network investment program talked about spending $4 billion, of which barely half was committed to the PCS/LTE program. Obviously some will have gone on spectrum acquisitions, but there is probably a reasonable amount left to fund additional 2G-to-4G activity. I understand all that. However, they can upgrade a few cell towers at a time. We are not talking about building new towers, just an upgrade of their current towers. The coverage area will remain the same or become slightly better because of new equipment, which will hopefully provide faster data speeds. If you experienced frequent transitions from 4G to 2G or vice versa here in Jackson, MS, then you will push for an upgrade plan as well. Once again, it depends on available spectrum as well as equipment. While it’s possible to move 1900 Mhz (PCS) bandwidth to support 3G/HSPA+, the ability in individual locations will be determined by the nature of devices owned by the local customer base. Until fairly recently, the vast majority of TM customers didn’t own a smartphone that was capable of handling 3G/HSPA+ on the PCS band. In fact over 50% didn’t own any kind of smartphone. You can only re-assign spectrum, if it isn’t going to create unacceptable congestion for the current users still dependent on 2G. There will also be issues relating to backhaul in some locations and the ability to upgrade capacity. There’s no point in upgrading the tower capability, if the backhaul can’t handle it. As technology progresses, so will the mobile devices being used. Phones and other mobile devices can be easily upgraded to phones that support 4G HSPA+/LTE. I am not asking that all of the PCS spectrum be re-assigned to HSPA+, just as much as possible to ensure that GSM and HSPA+ can exist on the PCS band. Just like the other carriers, wouldn’t T-mobile upgrade the backhaul as well? I know backhaul upgrades are expensive, but it is needed if Tmobile wishes to upgrade their network even after they acquire 600MHz spectrum. If Verizon and AT&T can do it, so can T-Mobile, it just might take more time and money to get the fiber and upgrades completed. Educate me! I thought that areas with TM subscribers that are on the gprs/edge areas are a roaming agreement with att, and that’s the reasoning of why these speeds are 2g. I didn’t think TM had towers in these areas that achieved these slow speeds. Those are T-Mobile’s own towers that are Edge and GPRS. The areas they roam off AT&T can sometimes be HSPA+, it’s just that their roaming agreement limits TMO customers to only accessing 2G data speeds when roaming on AT&T. oh ok… that was the essence of what this article was saying awhile back that I was reading. TMO has 15,000 towers with only 2G. Verizon and ATT were GIVEN their 12.5 MHz of 850 MHz which allowed them to provide coverage. The only area where TMO has ANY sub 1GHz is in Myrtle Beach; that’s it. Stop comparing TMO to ATT, VZW. Even Sprint has almost nationwide 800 mhz for 5×5 LTE, 1.25×1.25 1xRTT advanced. Of course, in time, all devices will be capable of utilizing multiple bandwidths, but as long as there is only the PCS band available in a given location it may take some time before a critical mass of users updates from feature phone to the required smartphone. The idea behind the Jump! program may in part be to help accelerate transitions in these areas, where the 600 KHz band may be deployed, but no current devices are capable of supporting it. The point is that as the PCS spectrum is re-assigned, it squeezes that which is available for 2G use. If the spectrum range is narrow to start with, there won’t be much room to maneuver. Dropping fiber into some locations will be a challenge, and the potential cost benefit may not justify making those locations a priority. AT&T and Verizon are much better placed to be able to do this considering that they are drawing, on average, $20-30 per month more from each customer and each has at least 60 million more customers than TM. That’s an additional monthly revenue of $1.2 billion each over Magenta. If they get close enough to Verizon, I’ll be thoroughly impressed. I have great coverage in Dallas, but cannot get over choosing to make the speeds faster rather than expand the coverage. Do I care if my phone will get (theoretically) 72Mbps? No! Do I care that when I drive to my parent’s house, or go camping, I lose single where Verizon, and AT&T, customers have coverage? YES! I’m slightly embarrassed when this happens. Stop worrying about the speed and start expanding the coverage. I can’t say I’m impressed with the lack of coverage expansion. Tmobile has no sub 1GHz spectrum while AT&T and VZW are both using 700 MHz for their LTE and 850 MHz for their voice, 3G data. It takes 3 times as many towers for TMO to cover an area as it does the other two. TMO can’t have the highest CAPEX+OPEX and lowest ARPU and survive. I live TMO but I’m realistic about what they can do with the spectrum they have and the money they’re bringing in. If you want Verizon- and AT&T-level coverage, then go ahead and double your bill. They do offer 2G service in all those areas. They don’t need to add new towers per se. They can retrofit existing cell sites with 3G or 4G cell sites. That’s what people want. At the very least I think it’s important for T-Mobile to cover all the highways. That way we can have good coverage at home and on our road trips. The most expensive part isn’t the cell sites. It’s the backhaul required to supply a data pipe to all these areas. He says he loses signal; I presume there is no 2G either, although it surprises me. You should be able to get a GSM signal anywhere in US with a quadband phone. At the very least, roam on at&t or someone else ! It’s not really doubling your bill. If you use less than 2GB of data per month and buy a flagship phone then it’s only $20 more per month if you go with Verizon’s Share Everything 2GB and that number drops further when you start adding more lines. Has anybody noticed that Cincinnati is (basically) the only large city that doesn’t have lte? It’s due to a lack of spectrum. T-Mobile doesn’t have a lot of spectrum for that region. Darn :( Thanks for the response, though. Maybe TMO will acquire Cincinatti Bell in the future. Cincinatti is a glaring hole in their network right now. We can hope. That is definitely true that Cincinnati is a huge hole in their network. I can’t even get consistent hspa+ (pcs, 1900) on my unlocked at&t phone. There are many places where I drop to EDGE. By acquiring Cincinnati bell, they would be able to use that spectrum to fix the current hspa+ situation and probably get their lte upa nd running too. Exactly. Just north of O’Hare airport there are several dead spots that I have NO SERVICE. Quite embarrassing when I want to call my wife and have to drive for a few minutes before I can make a call. Or vise versa have a dropped call after driving through this range, or my Spotify music drops off to a dead silence until it can pick-up a signal and continue with the song. I can understand if this was the rural area of any metropolitan area, but this is the THIRD LARGEST city in United States. I’ve called in several times over the years, but seems like no one can focus on bringing PHONE and at least 3G (if not HSPA+ or even LTE) service in those dead-spots. And their coverage maps are uber inaccurate, which is more a sales/marketing ploy to bring customers in thinking their house maybe covered, but in reality afterward you are screwed. I like what T-Mobile has done up to now, but clean-up the 3+ year old mess before you go on the 10×10 and 20×20 LTE services in my neighbourhood. I love the sound of this! I truly Hope Tmobile will aquire a lot more spectrum and turn the tides. and better building penetration in the future. Good think I live in Philly since it may have a good chance for it to hit my city quick. I’m still waiting for 10+10 LTE soon and 20+20 LTE some time next year. Is Honolulu a Top 50 market? any of the three US companies. You would think the parent company that has a strong global presence wold help out. How is T-Mobile USA bigger than its three main competitors, when both AT&T and Verizon each have at least 60 million more customers, drawing down upwards of $1 billion each month in additional revenue? Deutsche Telekom has its own issues in its home markets and has been chasing the $50 billion it paid out to acquire Voicestream etc for over 10 years. They took money from the breakup settlement with AT&T to service their domestic debt situation. It’s a simple matter of logic that determines TM stand a better chance of improving their position by first concentrating on those markets that contain 70% of the population. With around 45 million customers, mostly in the larger MSAs, it stands to reason that their potential growth there (i.e. up to 180 million POPs who are currently not customers) massively dwarfs the 87 million POPs who are distributed over a huge geographical spread throughout the rest of the country. TM has to close the revenue gap with AT&T and Verizon before it can be expected to deploy a comparable network. They’ve been concentrating on those markets for 11 years. If they want to go against AT&T or Verizon then they have to expand, otherwise they will never anything but a smaller cellular carrier. Bad thing is that if they did expand out to close to what the top 2 cover than they’d probably have to charge their prices too. You get what you pay for when it comes to cellular coverage. When they started they had 6+ million customers and in various spurts of growth over that period they put on another 25 million subscribers by concentrating on the top markets. Right now, a continuation of that strategy is resulting in their biggest period of growth for several years. Your observation about probably having to charge the prices of the top 2 carriers is another way of representing my final comment that TM has to close the revenue gap. Of course, if they are to grow to the size of AT&T and Verizon (which is in any circumstances unlikely), they will need to match their network. Right now there simply isn’t a magic formula for achieving that, least of all having the largest shareholder bankroll the change. TMO has no low-band spectrum so it has to put up 3 towers for every 1 tower the other guys have for LTE. Can’t do anything without low band spectrum. It’s simply uneconomical to deploy the tons of towers that would be required to expand HSPA+ to rural areas with the 1700/2100 AWS bands. Concentrating on metro areas is pretty much all they can do at the moment. They pretty much have to wait and hope that they can acquire a good chunk of 600mhz spectrum in the next round of auctions so that they can have the spectrum needed for rural LTE. You’re very misinformed. Deutsche Telekom wants to get the hell out of America, hence their attempt at selling to AT&T. They want to focus on the German market, not dump billions more into a loser. Yea because the American dollar is losing its reserve status. Our money is going to become worthless. Plus we have no production capacity anymore. This means jobs don’t pay as much equaling less customers. Get a straight talk phone with Verizon(50 dollars). ST saved my business, my phone bill was 300 dollars. The only prob is that they have horrible customer service. While I applaud their efforts and their undeniable improvements in both the american market and internally, they can no longer avoid the elephant in the room… Ask yourself this, what is the point of being allowed to drive 200 miles per hour in a car for a distance of less than a square mile? It’s the same concept when you have a 200MB/s connection that suddenly shrinks to a circa 1999 Edge network speed. 4G and LTE is absolutely pointless if you have to hope you are anywhere near it, or pray that you don’t find yourself on the beloved EDGE network indoors. This isn’t in just one town or city either, this has been the standard Tmobile since the beginning. I shouldn’t have to go all Lion King just to get a chance at a decent signal. This wouldn’t be such an issue if their 2G coverage was at LEAST 3G or HSPA+ speeds. I’m sorry but I’m NOT seeing their growth continue at this rate until they address this issue. I’ve seen the edge network since the 90’s on very old hardware, and I could pick that hardware up today and it would still be effective in 75% of the Tmobile coverage map. You can push data as fast as you want, faster than the speed of light for all I care, but if you don’t cover something bigger than a postage stamp then it’s useless. It’s time to get with the calendar and wake up! The EDGE network doesn’t cut it anymore, it never really did in the first place! I won’t even speak of areas where you see “No signal” that is simply inexcusable in the time we live in, with the current technology we have. No amount of MB/s is going to make that any more acceptable either. In my home town I had to use wifi just to get a damn phone call, can’t even ROAM in some places, while big red and big blue have 4G here.